Beauty stylist Rakshandra Ahshan, right, poses for a picture with her prize-winning model, Precious Spring, at a recent fashion show. DONGAN HILLS -- Born in India, Rakshanda Ahshan arrived on Staten Island 12 years ago. She came well-versed in glamorous transformations. She studied the art and craft of hair design and makeup on her home turf in Assam state in northeast India, earning a license there in 1990. Now a Dongan Hills resident, she has provided bridal makeup and henna-tattoo services to the Indian community here. Her eye is focused on a more ambitious dream, though: Opening the borough’s first Indian-style beauty salon, she told the Advance. Toward this goal, she participated in August in a four-week training program at the Center for Family Life Cosmetology Project in the Sunset Park section of Brooklyn, and earned a certificate. Next, she enrolled in a full-time, nine-month program at the Hair Design Institute in Bay Ridge, Brooklyn. She will graduate in April. Ms. Ahshan’s instructors at the Institute encouraged her to enter its various themed contests: Bridal, Halloween, Christmas, Winter Wonderland, and Valentine’s Day. She did and — drawing on her ethnic background and skills — always dressed her models in elegant Indian style, including one outfit that she sewed by hand for the Winter Wonderland event. “I won all the contests during the school year,” she proudly reported. 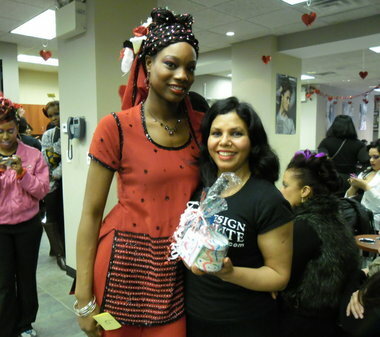 Her most recent first-place win was at the Valentine’s Day show, with Precious Spring — a Brooklyn resident and fellow student at the Institute — serving as her model. The fashion show — with 29 models — featured two themes, fantasy and romantic. “I choose fantasy, and again used Indian dress, jewelry, and makeup,” said Ms. Ahshan. Her model, Ms. Spring, “is an American girl who is beautiful, tall and very smart. When she presented herself, all the judges were surprised and stood up, and she was selected for first place. “I was very happy, and thankful to all the judges, teachers and students who helped me. I wanted the Advance to write a story, to express my thanks, and show Indian beauty with an American girl,” Ms. Ahshan said. And here’s more good news: The stunningly beautiful Precious Spring “got an offer for modeling, and she will start after she graduates from the Institute in March!” Ms. Ahshan happily reported. Ms. Ahshan is the mother of two sons, Raheel, 11, in sixth-grade at Egbert Intermediate School, Midland Beach, and 5-year-old Rahan, in kindergarten at PS 52, Dongan Hills. You can reach her by telephone at 718-987-0998 and 347-835-3087, or email at rakshandaahshan.2009@gmail.com.